In the 1920s and ’30s, H.P. Lovecraft pioneered a new type of weird fiction that fused elements of supernatural horror with the concepts of visionary science fiction. Lovecraft’s tales of cosmic horror revolutionized modern horror fiction and earned him the reputation of the most influential American writer of weird tales since Edgar Allan Poe. This omnibus collects for the first time in a single volume all of Lovecraft’s groundbreaking fiction: “The Call of Cthulhu,” “The Dreams in the Witch House,” “The Haunter of the Dark,” “At the Mountains of Madness,” “The Shadow out of Time,” “The Shadow over Innsmouth,” the full-length novels The Case of Charles Dexter Ward and The Dream Quest of Unknown Kadath, and many others. H.P. 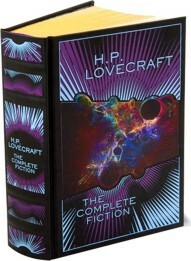 Lovecraft: The Fiction is part of Barnes & Noble’s Library of Essential Writers. Each title in the series presents the finest works—complete and unabridged—from one of the greatest writers in literature in magnificent, elegantly designed hardback editions. Every volume also includes an original introduction that provides the reader with enlightening information on the writer’s life and works. Note that the first leatherbound edition contains numerous errors. Martin Andersson has kindly provided an errata list for that volume. The second leatherbound edition has been corrected using this errata list. This book is also available in a hardcover edition, though it contains the same errors as the first leatherbound edition. H.P. Lovecraft: The Complete Fiction. By H.P. Lovecraft, with an Introduction by S.T. Joshi. New York, NY: Barnes & Noble, Inc.; 2011; ISBN 978-1-4351-2296-3; leatherbound, 1120 pages. This book may be purchased in leather from Amazon.com or Barnes & Noble.